Routledge, New York, 2001. 384 pp., numerous black-and-white illustrations, 7½x9¾". 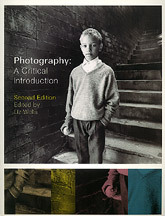 This is the second edition of a widely used and highly readable introduction to photography theory. Contributors include Michelle Henning, Patricia Holland, Martin Lister, Derrick Price, Anandi Ramamurthy, and Liz Wells. From the publisher, "There are a number of published histories of photography which define the field according to various agendas, although almost invariably with an emphasis upon great photographers, historically and now. Fewer publications critically engage with debates about the nature of photographic seeing."